I seriously doubt that the copy editor could read the minds of either the photographer or the troops in the photo. I would imagine that they were definitely joyous about going home ALIVE to their families, but when looking really closely at the picture the thing that seems to dominate the actions of the people is food. Or cigarettes. But mostly when looking hard at the faces in the photo, the men just look tired. Looking very closely at these types of images has always been fascinating; look close enough, under high magnification, and the large photo becomes composed of dozens of smaller photos. The whole is an assemblage of vignettes, each in themselves a work of art. Continuing in a more odd tone, I’m also reasonably convinced that after looking at hundreds of faces in a photo like this that you’ll find a picture of yourself. I did. This section is a 3200 dpi scan of a 15x10 mm section, and I am undoubtedly and unquestionably the bald bearded man (one of the few people in the image without a hat) at center-bottom. 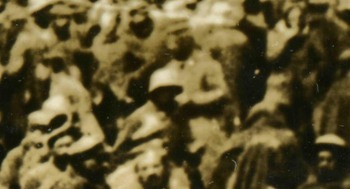 In this photograph, taken of American troops at a ceremony at the cemetery of St. Marie, Havre, France in November 1918, the massive crowd (the largest funeral service held in France) is almost entirely focused on the proceedings--except this one serviceman in front, lathced onto the photographer. 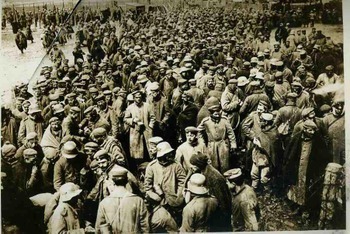 This remarkable photograph shows the joy and relief of the townspeople of Saudemont, France (20 kilometers south-east of Arras), after just having been freed from German occupation after four years of captivity. Saudemont had evidently suffered greatly over the four years, and seemed as though the population of the entire town was going ot be removed along with the Germans--but they weren't, and teh town was simply abandoned, found and recaptured by these Canadian forces. Original photograph, 1918. 8x6 inches. Good condition. $225. This image--from a collection that I've mentioned previously on this blog--shows a group of wounded-in-action American Doughboys recuperating in London on 4 July 1918. There were at least six of these soldiers aboard this bus, touring, being invited to celebrate their independence day in London, their flag--and a big one at that--draped across the bow of the upper deck of the bus. Like its more-famous WWII counterpart, scrap drives during The Great War were also frequently conducted. This is an original photograph showing just such a thing, depicting two Uncle Sams surrounded by Boy Scouts pulling a large hollow metal sphere--I believe that thin metal scrap would be hammered flat and then molded onto the sphere's frame, though I'm not terribly sure. I am sure that this is a great photograph. Needles and Threads; Sewing in Battle, 1918. This fantastic photograph calls to mind the importance of the little things of battle--dry socks, headgear, water, food, scissors. And of course a good coat in the winter--a good coat that can be kept closed to allow the body to stay warm, or dry. I mentioned in a post here just yesterday that it was a small thing that may have led to the demise of Napoleon's army in Russia in 1812--the buttons on the overcoats of the soldiers were made of tin, and as tin becomes brittle in severe cold, it is conceivable that the buttons failed and therefore allowed the jackets to blow open much more easily than normal. Little change that has an enormous impact. This photograph--an official French photo published by the Western Newspaper Union in November 1918--shows a group of French telegraphic soldiers, taking a break, and mending their clothes. The original text for the photograph (below) points out that their uniforms were torn and made shabby by continuously running themselves up and down telegraph poles. It is important to keep yourself fit and fed and your uniform in good order, so they calmly awaited the repair of their uniforms y the one man with a needle and thread. 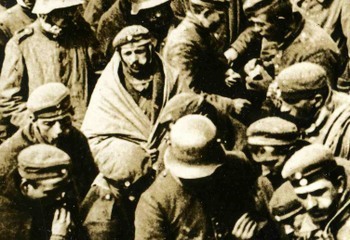 In this image here we are introduced to a small group of captured German soldiers displaying a wide range of emotions over a wide range of faces. There were over 8 million soldiers taken prisoner during WWI, that in addition to the 21 million who were wounded and the 9.7 million killed: 38 million. Plus 6.8 million civilians who were killed: 45 million. And the numbers for civilians wounded are just, well, not reliable, as they were not really collected, or collectible. At the end of it all, there were probably between 50 to 75 million soldiers and civilians killed or wounded or taken captive during the war...not including civilians who were killed by the hardships or starvation caused by the conflict. Big, big numbers. (AN earlier post here looked at the population/percentages of these losses, here). Detail: this shows struggle and age in a face that I reckon to be a mid-teen's, a child's face, hardened baby fat. Detail:the older man isn't much more so, just beaten, exhaustion. Detail:they look defeated and concerned, though the middle guy (who doesn't seem to quite fit in with the rest) looks as though he may be relieved. Maybe not. Perhaps one of the worst inventions in the history of warfare was The Trench. Millions of men were wounded or met their ends while defending one, or attacking one, or being in-between two of them. Hundreds of thousands of troops spent months charging back and forth between opposing lines, the ground over which they fought made uninhabitable for almost any form of life. Cold, wet, bad.